Some intrepid yachtspersons (including your webmaster) have once again been able to walk ashore with dry feet at Queenborough thanks to repairs being made by Queenborough Yacht Club. Once these repairs are complete, the ATL will be handed over to Queenborough Harbour Trust. Meanwhile please take great care on the walkway. Phil Shaw says that short stays (up to 4 hours) on the visitor moorings are free but the trot boat is £1 for a return trip to shore. If you pay for a mooring the trot boat service is included. After a few years of much improved operation, we are once more receiving reports of excessive delays at Kingsferry Bridge, which is supposed to open once an hour on request. The bridge is operated by Network Rail. If you cannot get a response from the bridge operator on VHF channel 10, or you are held up for an excessive time, please contact Medway VTS on VHF channel 74 and ask for the incident to be recorded. Delays at the bridge can seriously affect the viability of Queenborough Harbour as a destination for visiting yachts. It can also jeopardise the safety of boats heading for moorings in the Swale creeks due to their limited tidal access. If you want to try out an Alto two person, single trapeze, club racing dinghy, pop over to Gillingham Marina between 10.00 am and 4.00 pm on Saturday after supporting your club’s Push The Boat Out event . In conjunction with the Medway Watersports Centre you can also try out a RIB. The latest Suzumar and Sun sport inflatable dinghies are on show in the chandlery where VAT-free deals are on offer betwen 9am and 4.30pm. An unexpected visitor could still be lurking at a marina – after it surprised fishermen and onlookers by swimming into Gillingham’s waters. 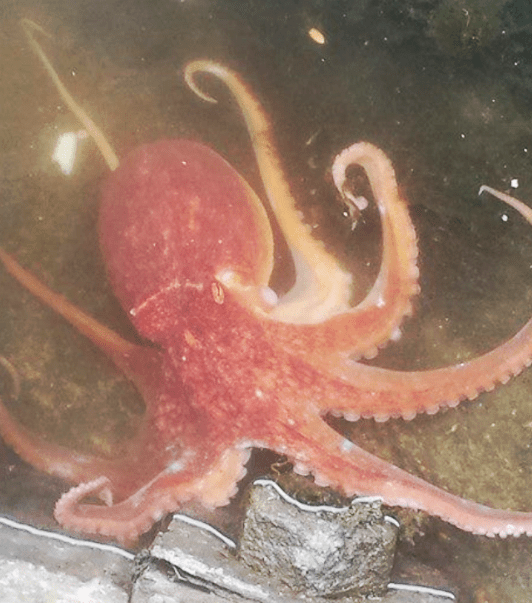 A red octopus was spotted by the marina wall near the hoists where the boats are taken in and out of the water. The marina was holding a Boat and Chandlery Fair, and Mr Dutch said he thinks it could have attached itself to one of the boats and hitched a lift into the marina or managed to swim in whilst the lock gates were open. At the moment it is unclear if the strange guest is still swimming around the marina.Mr Dutch said it could have made its way back out, but added that people were talking about catching it and releasing it out at sea. He said it would have to be released about a mile out to sea as “they are very intelligent creatures and it could find its way back”. The species of the octopus remains a mystery, but a spokesman for the Kent Wildlife Trust said he believed it was a common octopus (Octopus vulgaris). If you have an interesting boat, please join the Sail Past at this year’s Medway River Festival on 12 July. Download the Sail Past Form and send it to Sue Harding, Senior Events Officer at Medway Council, sue.harding (at) medway.gov.uk or phone 01634 338176.